This charming genre-defying film, based on a true story, tells what happened when Kumail, a Pakistani-born comedian, met Emily, an American grad student. Rating: 3.5 stars out of 4. Throw a coma into a rom-com, and suddenly you have something else. If you’re unlucky, it’s a soap opera; if you’re lucky, it’s “The Big Sick,” a charming new genre-defying film with an unexpectedly big heart. Written by Kumail Nanjiani (of HBO’s “Silicon Valley”; he also stars in the film, as himself) and Emily V. Gordon, “The Big Sick” has the sort of plot that feels like a screenwriter’s premise — except that it happens to be true. 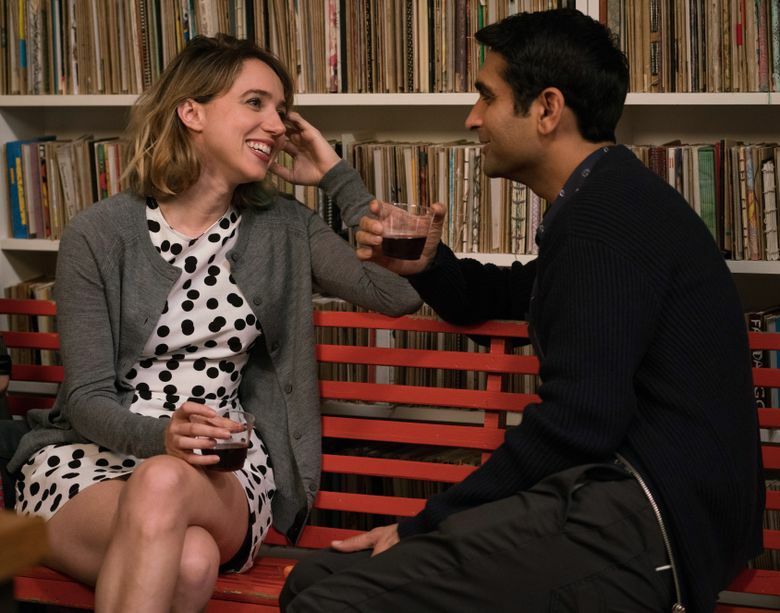 It’s the story of what happened when Kumail, a Pakistani-born comedian, met Emily (played, sparklingly, by Zoe Kazan), an American grad student, and began a romance, despite fearing what his traditional Muslim parents might think. (They were planning an arranged marriage for him.) Then — and this is the part that feels like a writer made it up, but not — Emily suddenly became seriously ill. As she lay in a coma, he had to make a choice between tradition and love. This is a lot of drama for a film whose feet are planted in the feathery territory of rom-coms, but what makes “The Big Sick” such a pleasure is the lightness with which it approaches its story. Kumail and Emily banter adorably: He’s got a cutely rehearsed earnestness, which makes his zingers all the funnier; she’s dryly distant early on, carefully guarding her heart, until she suddenly looks at him like he’s her first sunrise, saying, “I am overwhelmed by you.” Kumail, enthralled but terrified of losing his family, tries to resist — and then along comes The Coma, like the third corner of a love triangle, and everything changes. ‘The Big Sick,’ with Kumail Nanjiani, Zoe Kazan, Holly Hunter, Ray Romano, Anupam Kher, Zenobia Shroff, Adeel Akhtar. Directed by Michael Showalter, from a screenplay by Nanjiani and Emily V. Gordon. 119 minutes. Rated R for language including some sexual references. Lincoln Square, Meridian. Throughout, “The Big Sick” has a gentle realness to it; even its scenes that feel a bit slow (the movie sags a tad midway through) seem to reflect the eternity that is life when someone’s in the hospital. There’s much pleasure to be had from the character actors who play the couple’s parents: Holly Hunter (who threatens to steal the film as Emily’s mercurial mom), Ray Romano, Anupam Kher and Zenobia Shroff. But mostly, the movie works for the reason that all the best rom-coms do: you fall in love, a little bit, with Kumail and Emily, and want them to stay together. Love, this movie reminds us, is often inconvenient; but it does ultimately conquer all.